Imagine a world in which all entrepreneurs were each other’s advisors. We’d each be aware of the best practices, innovations, pitfalls, and traps that lie ahead and collectively we could all make it easier to succeed for everyone. The more successful entrepreneurs there are, the more potential supporters, partners, and advisors there are. That may be unrealistic today, but we can move in that direction by having many advisors instead of just one or two, and use systems like Mind Money Meaning to coordinate, organize, and prioritize the advice we get from advisors into a cohesive sequential plan for success. What’s an Underpants Gnome, and What’s that Got to Do With My Business Mentor? If you’re not a big South Park fan, you might not of heard of the “Underpants Gnomes” – so I’ll fill you in. South Park is an animated TV series for adults. The main characters are kids in the town of South Park. In this particular episode, the kids are frustrated because their underpants keep disappearing. They stay up all night, and finally catch an Underpants Gnome who has been stealing them. They follow the Underpants Gnome back to his hide-out, and they discover a huge warehouse filled with stolen underpants. 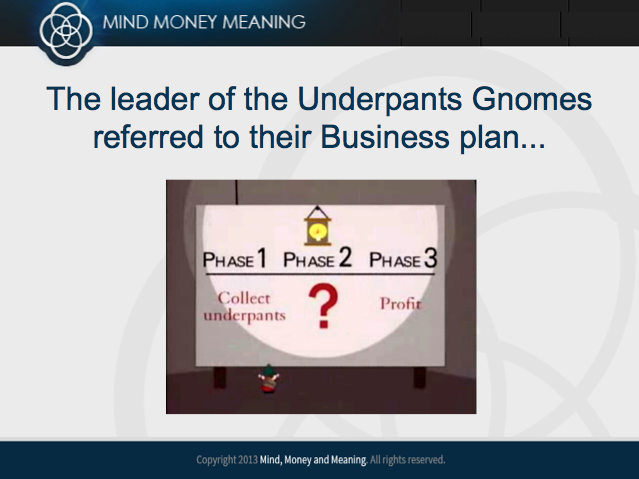 And that’s when the leader of the Underpants Gnomes referred to their business plan. This episode came out during a time when Silicon Valley companies were reeling because too many had been funded without a clear plan for how they were going to make money, leading to the “Dot Bomb” crash in 1998 and 1999. And I think it’s still funny. Because it still has a relevant message for entrepreneurs today. Not only does it point to the importance of sequencing, but it also tells us that we have to reveal our plans to advisors and mentors. And if you don’t have a clear “step 2” you might as well be stealing underpants, because you and the Gnomes have the same exact strategy. That’s why I’ve taken the time to explain exactly how you can let mentors and advisors dramatically change your trajectory. When they understand the “Point A” to “Point B” of your business, they know the right sequence (the right order of steps) to produce massive growth in your profits and income. You and I can start filling in that second step together with Mind Money Meaning.